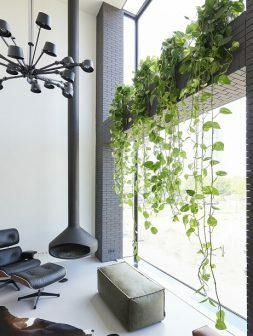 Hanging, climbing – Devil’s Ivy, also known as Scindapsus, can go in all directions. This houseplant stands out thanks to its heart-shaped satin leaves with silver, pale green, yellow or whitish spots or a flame pattern. it’s also a reliable companion: if looked after well, this domestic wonder can grow very old yet remain beautiful. The plant also gives something back in return for your loving care: according to the NASA Clean Air Study, Devil’s Ivy is one of the plants that helps improve the air quality in your home. The Devil’s Ivy range is fairly limited. The best-known form has green leaves with pale green or yellow markings. ‘Argyraeus’ has small grey spots, ‘Trebie’ has coarser leaves which have more grey marbling. The ‘Silvery Ann’ cultivar has more soft grey in the leaves. Emphasise Devil’s Ivy’ versatility by displaying the plant both hanging and climbing. A couple of hanging specimens side by side soon create the illusion of a green curtain or room divider. Replacing the moss pole of the climbing specimens with a more natural looking branch makes the plant trendy and create a particularly exciting silhouette. Devil’s Ivy is also one of the few houseplants where the tendrils can also be displayed lying down.